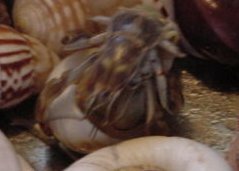 Since hermit crabs are not true crabs and have an unprotected abdomen, hermit crabs need shells to wear in order to keep themselves safe and moist. Be sure to provide them with plenty of shells to move around and grow into. The looser shells provide them adequate moisture and room for moving around. Hermit crabs use their large feeder claw to measure the size of the hole in width and depth before fitting into the new shells that they look at. If a hermit crab is not given shells to grow into, it can cause death due to lack of air or moisture in the end. Usually when a crab is in its shell, is uses its large feeder claw with its other legs folded neatly around it, to close the hole to his shell as a type of door in order to keep the retained water within the shell from evaporating, and to keep preditors out. The best fit is usually a shell with the hole the size of the crabs large feeder pincher plus 1/8 of an inch added around. Hermit crabs seem to also prefer the turbo shells and shells with a pearl color inside. We are not sure why, but this has been known to draw attention to the crabs and it makes the shell exchange a more frequent occurrence. Besides changing for growing purposes, the crabs like to switch for variety as well. 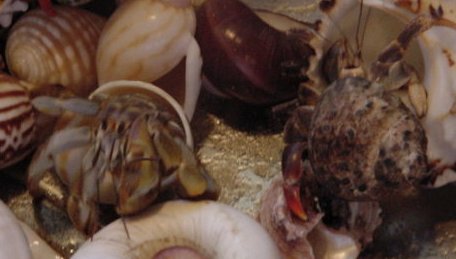 Some will switch shells more often than others, so don’t be alarmed if one doesn’t change as often as the other hermit crabs in your tank. Some just get use to the shells they have, like our good ol’ pair of tennis shoes that Mom wanted us to throw away as kids. Usually, providing clean shells after bath time will encourage shell changing, and it can be fun to watch for the entire family. Ecuadorian crabs do not tend to change shells as often as the Purple pincher and reds do. They tend to only change when they feel the need to rather than the urge. Provide shells that fit the crabs well. Purple pincher and red hermit crabs have rounder abdomens than the Ecuadorians do, so the rounder the holes the better for them. I use both types of shells in my drying tub due to having all three types of crabs and I find that the shell preference is true for many of my crabs, but two of my Purple Pincher crabs are currently in shells with a very narrow hole (Like the Ecuadorians tend to use more often) and do not seem to want to change. I suppose this all really depends on the personality and taste of the crabs! I guess that variety is always best! Have fun!